Is economic growth the solution to our challenges? Will it really deliver prosperity and wellbeing for a rapidly growing global population and allow us to live on a planet with finite resources? Should our prosperity be measured by the size of our gross domestic product? These questions and many others were at the centre of the 40th TB Macaulay Lecture, given by Tim Jackson, Professor of Sustainable Development at the University of Surrey and Director of the Centre for the Understanding of Sustainable Prosperity (CUSP), on 4th October at Our Dynamic Earth, Edinburgh. Professor Jackson’s book, “Prosperity without Growth”, is a world-renowned landmark in the sustainability debate. Originally published at the outset of the global financial crisis, Jackson's seminal work challenges orthodoxies, causing us to question the primacy of economic growth at all costs, and has drawn praise across the world from politicians to Nobel Prize-winning economists. 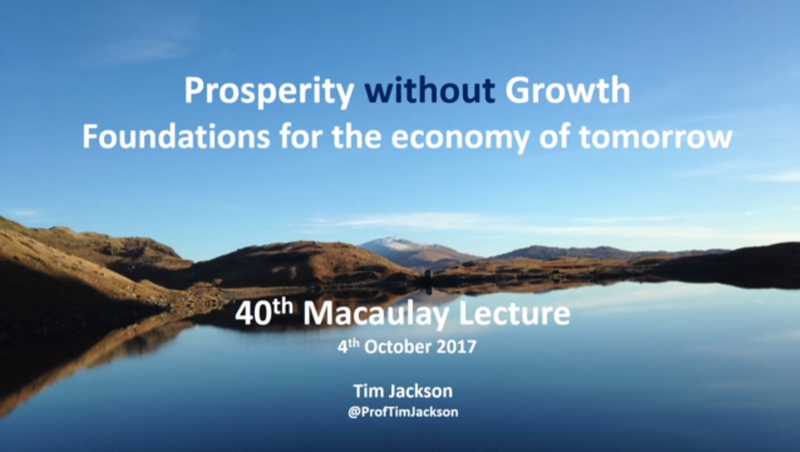 Against a backdrop of Brexit, and ongoing debate over Scotland's economy and where growth could or should come from in the future, Professor Jackson showed how we can exist within the ecological limits of our planet and helped us understand how we can chart a course to a new longer-lasting prosperity. For the first time in the 40-year history of the TB Macaulay Lecture, the lecture was streamed in real time to viewers across the world through the James Hutton Institute's YouTube channel. A video of the lecture is available to watch on YouTube. Prof Jackson also discussed how much Scotland has changed both economically and socio-politically in recent years, focussing in particular on Brexit from a Scottish perspective; on how Scotland can develop its economy; and on how economically autonomous Scotland can be in a globalised world facing major environmental challenges. The publication of his book Prosperity without Growth was a landmark in the sustainability debate. In it, Jackson challenges conventional economics and openly questions the most highly-prized goal of politicians and economists alike: the continued pursuit of exponential economic growth. His findings provoked controversy, inspired debate and led to a new wave of research building on its arguments and conclusions. Seven years after it was first published, on the occasion of substantially revised and updated second edition, Jackson will discuss how much has changed (and remained unchanged) in the interim and argues that building a ‘post-growth’ economy is now a precise definable and meaningful task. Tim Jackson holds a Professorial Fellowship on Prosperity and Sustainability in the Green Economy (PASSAGE). In addition to this he is an award-winning playwright with numerous radio-writing credits for the BBC. He joined the University of Surrey in 1995 under a Royal Academy of Engineering fellowship on the thermodynamics of clean technology, after five years as Senior Researcher at the Stockholm Environment Institute. In April 2000, he was appointed as Professor of Sustainable Development at Surrey, the first such chair to be created in the UK. Between January 2003 and April 2005, Jackson held a research fellowship on the social psychology of sustainable consumption, supported by the ESRC's Sustainable Technologies Programme. His monograph Motivating Sustainable Consumption (2005) drawing on research from that period is still widely cited in both academic and policy circles and was influential in framing the Changing Behaviours chapter in the 2005 UK Sustainable Development Strategy. During his time at the Stockholm Environment Institute, he pioneered the concept of preventative environmental management outlined in his 1996 book Material Concerns: pollution profit and quality of life. In 1996 he co-authored (with Nic Marks) the first Index of Sustainable Economic Welfare for the UK and has continued to work closely with the New Economics Foundation and others on measures of sustainable wellbeing at national and regional level. During the last decade, he has led numerous research and policy initiatives on sustainable consumption and production in the UK and abroad. From June 2004 to March 2006, he was the sole academic representative on the UK Sustainable Consumption Round Tableand co-authored their influential report I will if you will. In 2006 Tim published the Earthscan Reader on Sustainable Consumption. He led the team which developed the Surrey Environmental Lifestyle Mapping (SELMA) model used to estimate the UK's 'carbon footprint' for the Carbon Trust. He is a co-author of the WorldWatch Institute's influential State of the World 2008 on sustainable economies. From 2006 to 2009, he led the SDC’s Redefining Prosperity programme and authored the controversial report, later published by Earthscan as Prosperity without Growth: economics for a finite planet.